Products produced in the US has attracted customers from all around the world. Sectors like fashion and electronics, household goods etc. have provided a leading number of customers via e-commerce. And Canada has been one of the largest markets of these products. So, as there is ever increasing demand, it is certainly the right time to expand your business to the largest neighboring nation. And to power your business you’ll need the best shipping integration which is economic and provides assurance. We’ll have a comparison of the different shipping carriers available, their coverage area in terms of reach(FedEx, UPS may not cover all the areas or may not be the cheapest option at times, on the other hand, USPS and its partnership with CanadaPost, can ensure that you reach all corner of Canada and of course at the lowest shipping rates via Stamps.com). How is Canada a Great E-commerce Market? Expanding your business to Canada can be a great boost to your business. There are a lot of factors that point towards this fact. Let’s see a few. Revenue in the “eCommerce” market amounts to US$22,037m in 2018. Revenue is expected to show an annual growth rate (CAGR 2018-2022) of 7.9% resulting in a market volume of US$29,834m in 2022. The market’s largest segment is the segment “Fashion” with a market volume of US$7,071m in 2018. User penetration is at 53.6% in 2018 and is expected to hit 65.8% in 2022. The average revenue per user (ARPU) currently amounts to US$1,114.54. Both the US and Canada, with a shared border, have had an ever-increasing close cultural, economic ties and similarities. The shared historical and cultural heritage has resulted in one of the most stable and mutually beneficial international trade in the world. This co-operation in trade has made the e-commerce flourish between the countries. People in both countries use English as the language of transaction and people in Canada love the products from the US. This makes Canada an even easier market to penetrate. As an advanced economy, Canada has a well-developed e-commerce infrastructure. Majority of the population have internet connectivity and a large percentage of them use smartphones for transactions. Further, USPS partners with Canada Post for delivering packages inside Canada, which has a nation-wide presence. Canada Post which delivers 2 out of 3 packages in Canada summing up to around 16 million destinations reached. Real-time tracking of parcels is also available for all packages. As much as 67% of all the purchases made by Canadians come from other countries. Which means there is a high probability that they might opt for a product form the US if the product is fine and it can be delivered soon to them. Why USPS? When compared to other popular shipping services, it is evident that USPS helps you provide much diverse and economical shipping solution. This is almost suitable for a flourishing e-commerce business. For Priority Mail International, there are 7 shipping zones. If your business is located in a major city, like San Francisco or Chicago, then you will fall in Zones 1.1 and 1.2. These cities are located close to USPS international service center, allowing for an easier shipping route, therefore a cheaper shipping rate. Along with the distance to the Canadian destination, the USPS also takes shipping routes into consideration to determine the shipping rate. Find the complete price list. Commercial Priority Mail International Prices for Large Envelops & parcels. Our plugins for USPS requires an e-VS account for discounted shipping rates. It also requires a minimum of 50 parcels per week to be eligible for an e-VS account. In this scenario, we have WooCommerce Stamps.com Shipping Plugin with USPS Postage and WooCommerce EasyPost Shipping Method with Print Label which let you print the shipping labels at discounted USPS prices. These don’t require a minimum volume and you can start with one package per week too. 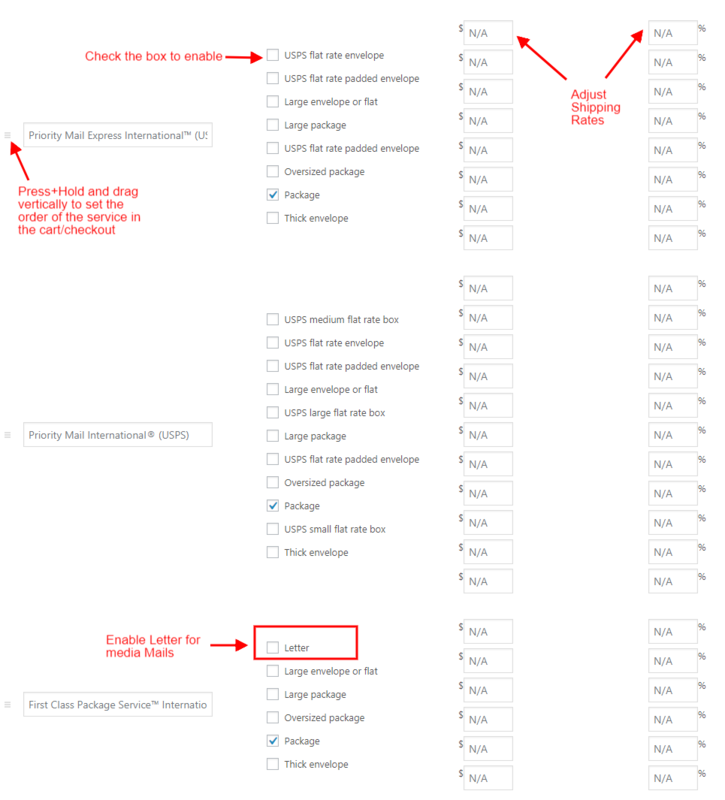 Options available with WooCommerce Stamps.com Shipping Plugin with USPS Postage are shown in the screenshot below. EasyPost offer a slightly lesser number of services form USPS. You can select the service you want to offer to your customers. If you want the option of a media mail, check the option as ‘Letter’. In the image above, ‘Package’ is marked in all cases. It means that the service will use a package. If you want to use a flat rate you can check the flat rate option for a particular service too. You can also adjust the shipping prices in terms of $ or % of the actually returned rates in real time. International Shipping is subject to different custom taxes and tariffs based on the country of manufacture. Let’s see the duties, taxes, and tariffs applicable when products enter the borders of Canada. Goods and Services Tax (GST): GST accounts for 5% tax on imported products. It is collected by the federal agency. This can be considered as the central tax and is applied in addition to other taxes applicable. Harmonized Tax (HST): HST act as the total taxes charged for participant provinces. It varies from province to province. This may not be applicable to all the provinces and the current number of providence charging HST has to be checked with your Accountant. This is like a harmonized tax of provincial sales tax and the general sales tax. Provincial Sales Tax (PST): Any provinces not a part of HST has formulated their own taxes at the state level. The tax rate varies by province and can range from 5% to 9.75%. Tariffs are charged in addition to taxes and are not dependent on the province. Tariffs depend on the country of manufacture, not the country from where the product is purchased. NAFTA eliminates tariffs on all goods that are manufactured in the U.S. and shipped to Canada. However, if your product includes components that were manufactured outside the U.S., then your Canadian customer will need to pay tariffs on those components. 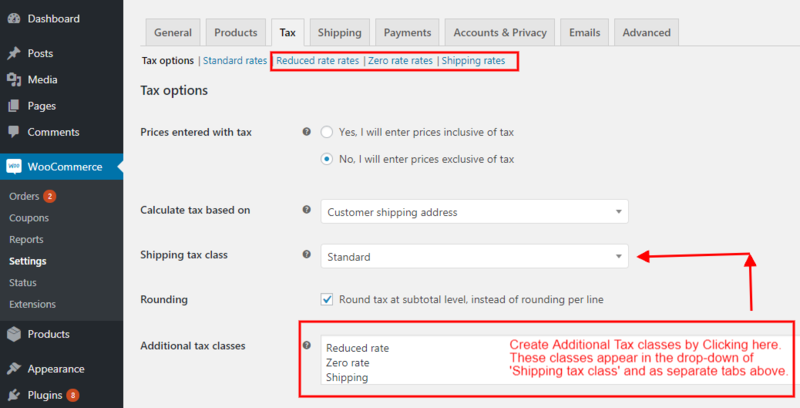 To get the Tax tab in the WooCommerce Settings, navigate to your Dashboard> WooCommerce> Settings> General to find Enable Taxes. Once you have the tab, create taxes classes based on your requirement. Each of the tax class created appears on the top as shown in the screenshot. As you click on these you get to set the taxes based on Country Code, State Code, Zipcode, and City. The screenshot below shows the option available after you select to set one of the classes. To specify any tax as ‘Shipping Tax’, check the box as shown. Follow our guide to Shipping Taxes for setting the correct shipping taxes. Tobacco and few more from the list here. The following customs forms are required for shipping into Canada. Business papers and commercial documents. PS Form 2976-B placed inside PS Form 2976-E (plastic envelope). Merchandise samples and gift shipments (non-commercial parcels). PS Form 2976-B placed inside PS Form 2976-E (plastic envelope). Merchandise (commercial shipments) and all articles subject to customs duty. PS Form 2976-B placed inside PS Form 2976-E (plastic envelope). For more precise information you can contact support at Stamps.com. Stamps.com is the single largest online vendor of USPS Postage. It provides all its customers with the discounted rates of the postage printed. You need to have a Stamps.com account to use the services. With its integration to WooCommerce through the plugin, you get the following features. As per stastica.com, e-commerce accounts for 10.2% of retail sales around the globe in 2017. And the share is projected to reach 17.5% by 2021. So you can expect a high rise in your revenue by selling and delivering your products to Canada. If you have just started with international shipping our Beginner’s guide to International Shipping is going to help you in multiple ways. And when you are ready with the basics, find the best USPS shipping plugin. For more such useful plugins, visit our store. Happy Selling!